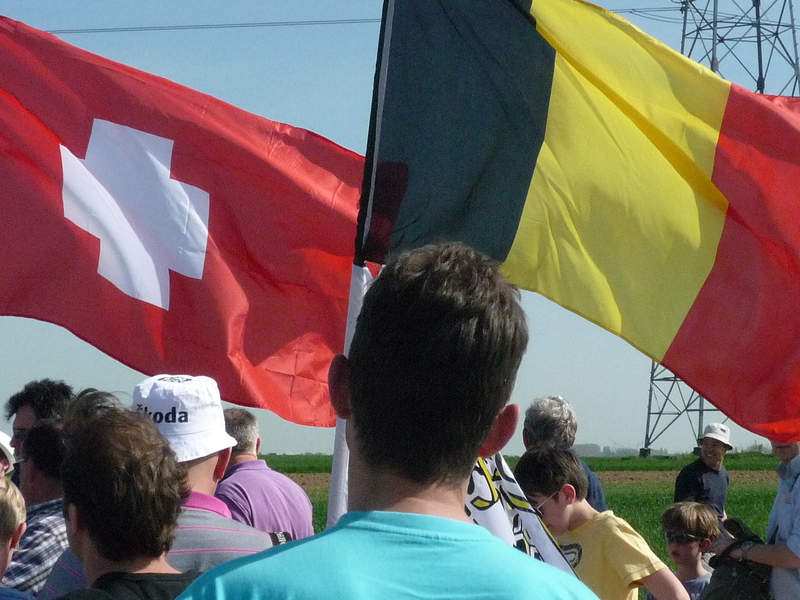 The lads of Pavé had a full itinerary set for us on Sunday as well, and we were up and on the road to Belgium by 8am. 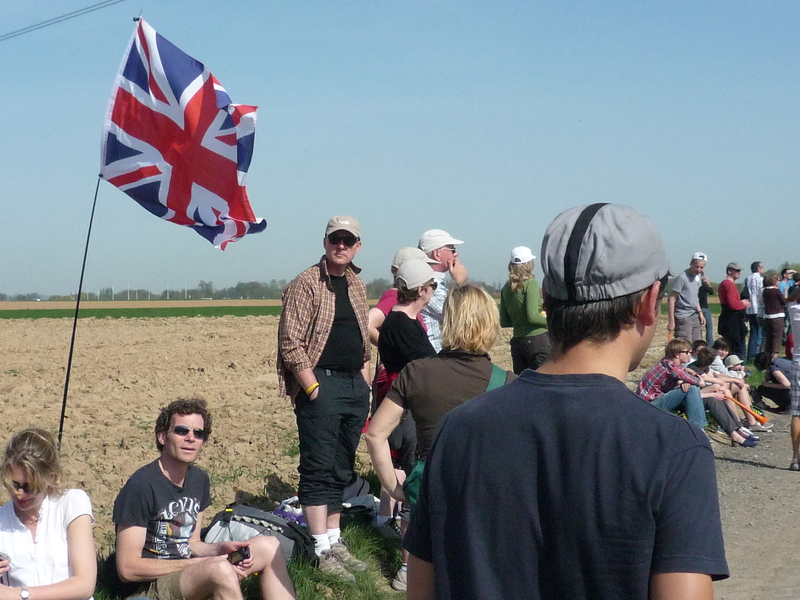 William, the Brits, Youenn and I (with Alex pulling support duty) did five climbs in all – the Kluisberg, the Knokteberg, the Oude Kwaremont, the Paterberg then the Koppenberg. 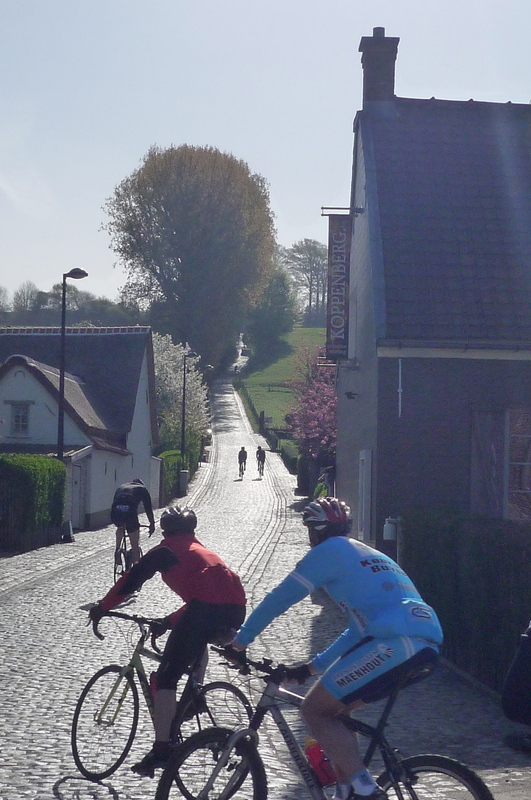 All these climbs feature in the Tour of Flanders, the Classic race that happens a weekend before Paris-Roubaix. 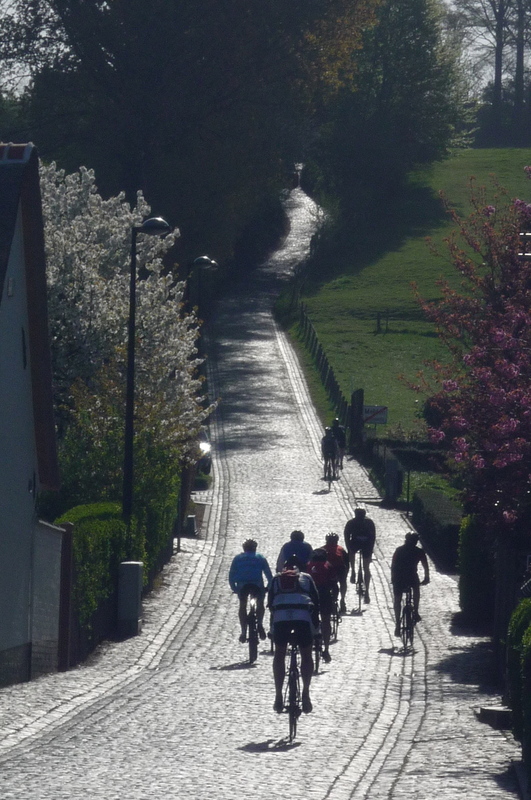 Here is the bottom of the Koppenberg. It was Sunday morning and I am sure I have never seen as many recreational cyclists in my life. 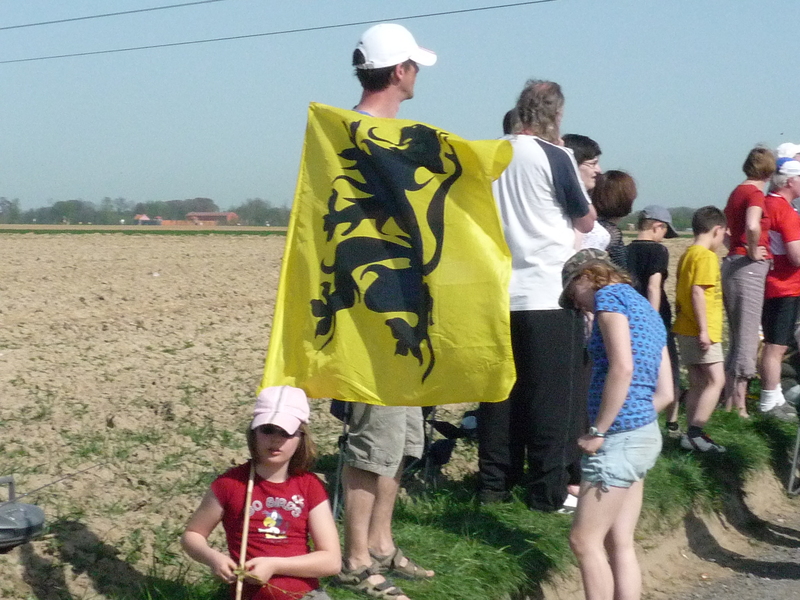 Everywhere we went in Flanders the roads were filled with riders. 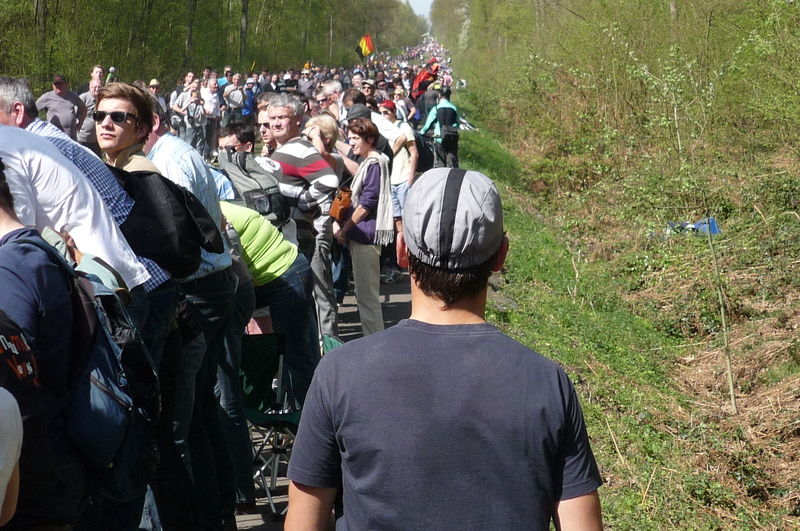 I suppose they don’t call Belgium the cycling Mecca for nothing. These 3 photos were taken seconds apart and you can see the endless stream of riders rounding the corner into the climb. And how was that climb, you ask? First a video to warm you up. It’s amateur, but gives you an idea of what 22% gradient looks like at least. The guy walking his bike up the hill is Fabian Cancellara. No team cars are allowed up this climb, so it’s hike it or go home. Remember that extra weight I was bragging about yesterday on the cobbles? Well, it didn’t serve me all that well today on the climbs. I suffered badly, but made it up all of them. 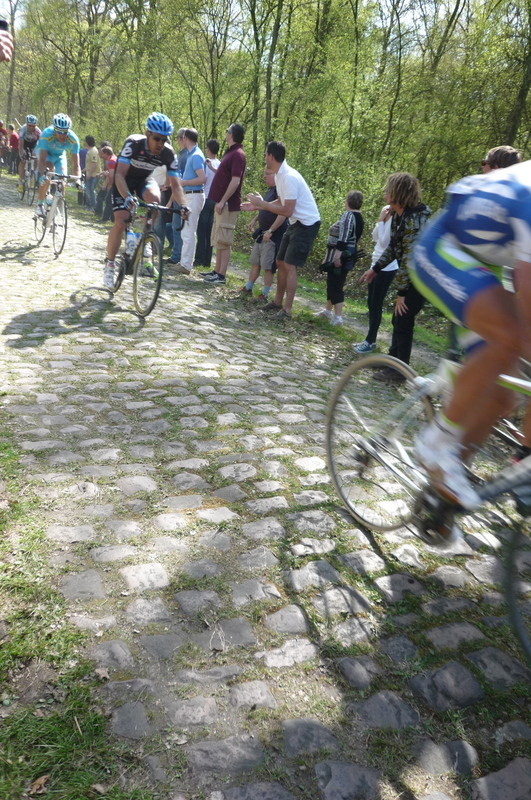 The cobbles are not rough at all, but they make 22% seem much worse (like it needs to!) than it is. Thankfully none of these climbs are long, so it was over before cardiac arrest set in. One last thing about this area of Flanders; it is really lovely, at least when the sun is out. Mostly flat, with lots of these little hills if you fancy a climb. Narrow roads all over the place and bike paths galore. The atmosphere is quite different from France as well, with welcoming cafes and restaurants dotted around the hills. Oh, and if you do go, bring lots of money. We visited a great bike shop at the bottom of the Kluisberg. We were almost late for the pro race later and Alex and William had to pull us out to get us on the road again…I’m glad I was broke or it would have been dangerous. 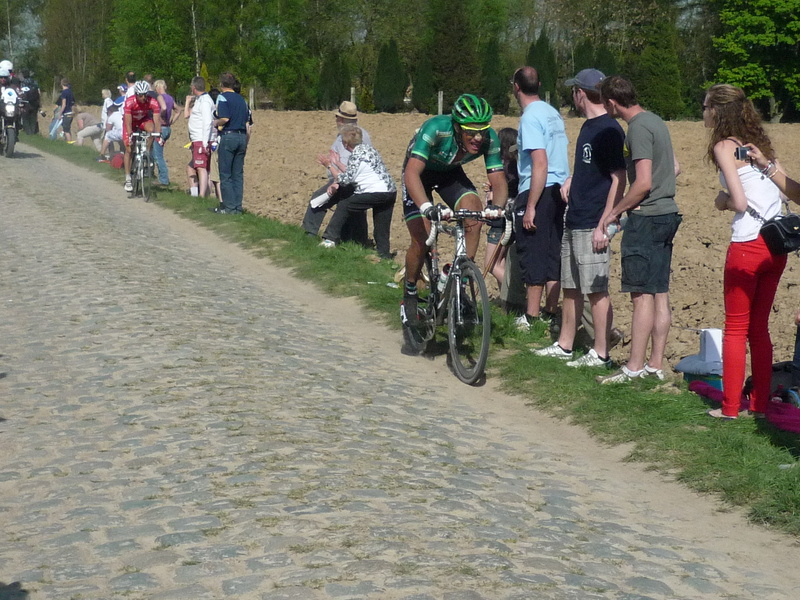 Here are Pavé’s Flickr Photos from the morning. But we did make it, just in time. After a mad rush back to the HQ for a shower, beer and BBQ (with more beer), we drove over (with a beer for the road) to the scene of yesterday’s misery – the Arenberg Forest. Once the action started I just blindly pointed and shot. Here are some of the results. 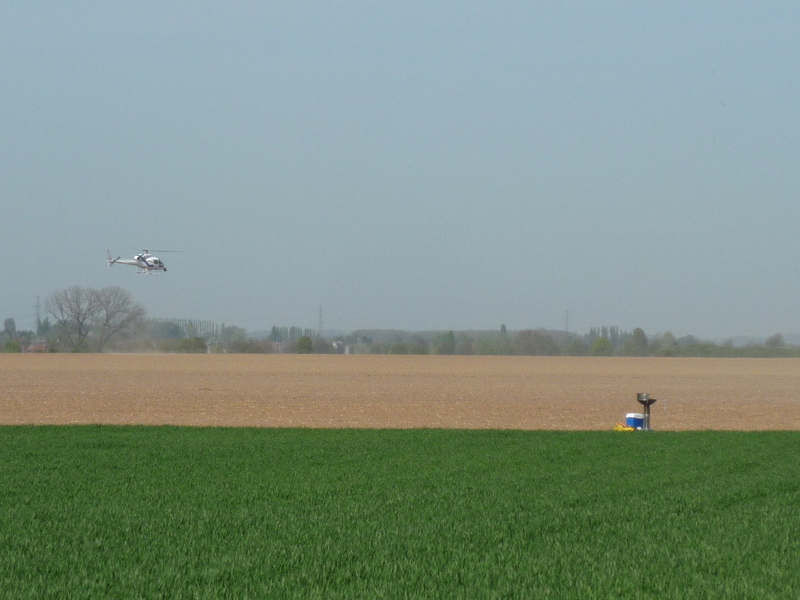 Tip for pro race spectators: if you want to know where the front of the race is, look for a helicopter. You can see from the photo above that they are just entering into the ‘trench’. 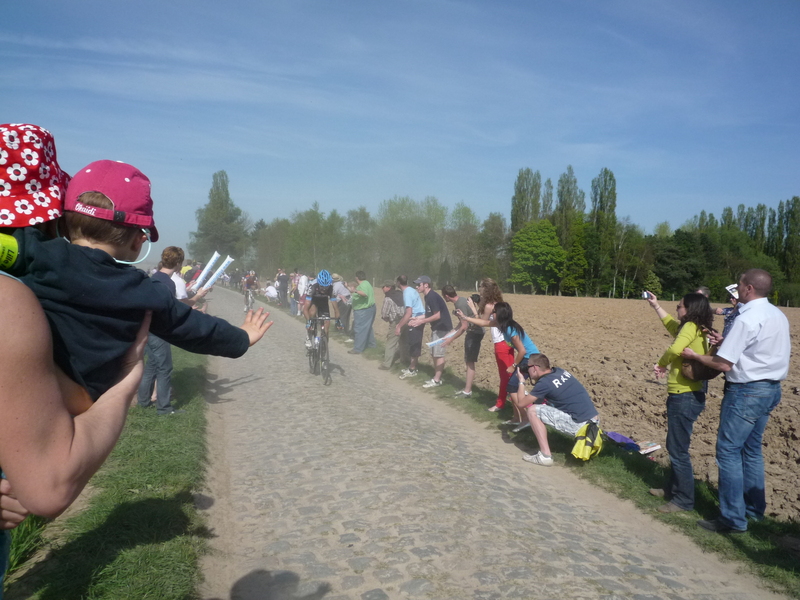 Paris-Roubaix is a special race. 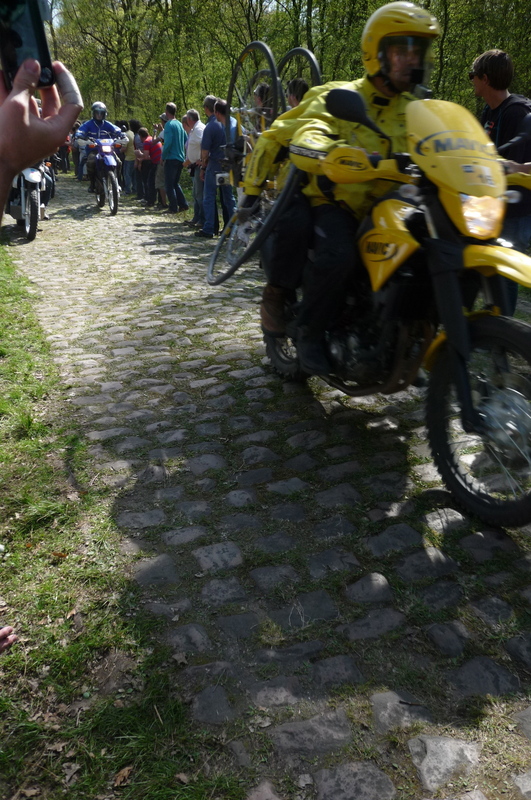 The gendarmes use off-road motorcycles and the Mavic guys (suppliers of wheels if the team car isn’t available) have to carry wheels with them on the back of their bikes. It’s a rough race. 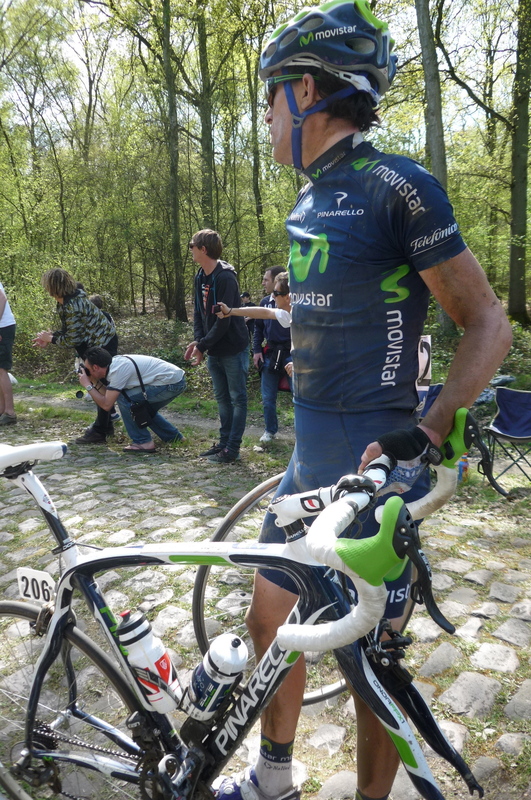 I took about 20 or so shots like this before we got up-close and personal with this poor guy from Team Movistar. He had a flat right in front of me. Above, he’s calling a team car he can’t see. So he waits, wheel in hand. …and while he keeps waiting I notice this on his top tube. 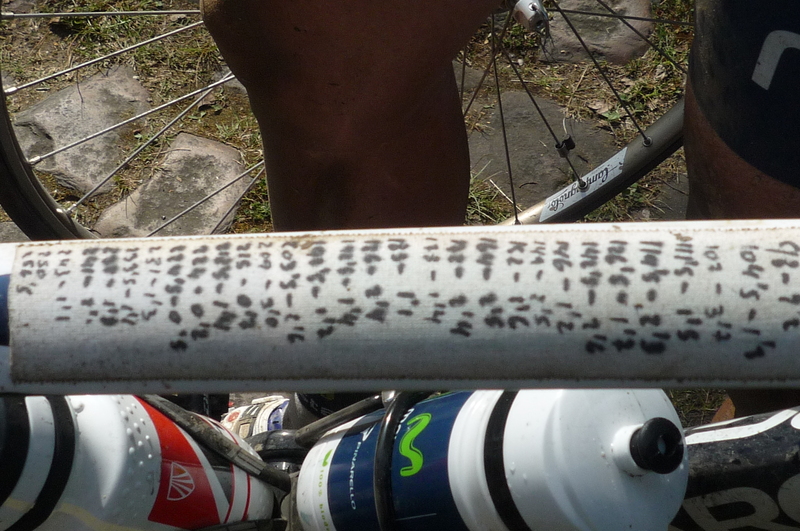 This is tape that he has put on, with all the 29 sections of cobbles, where they occur (in km) in the race, and how long they are (also in km). I’m not sure I’d like to know, myself. Could be depressing. Finally help arrives and he’s off again – just another victim of le trouée. And so were we (off, not victims…). The idea was to catch the race again up the road a bit, but the cops were on to us (and everyone else) and had all the exits from the highway closed. 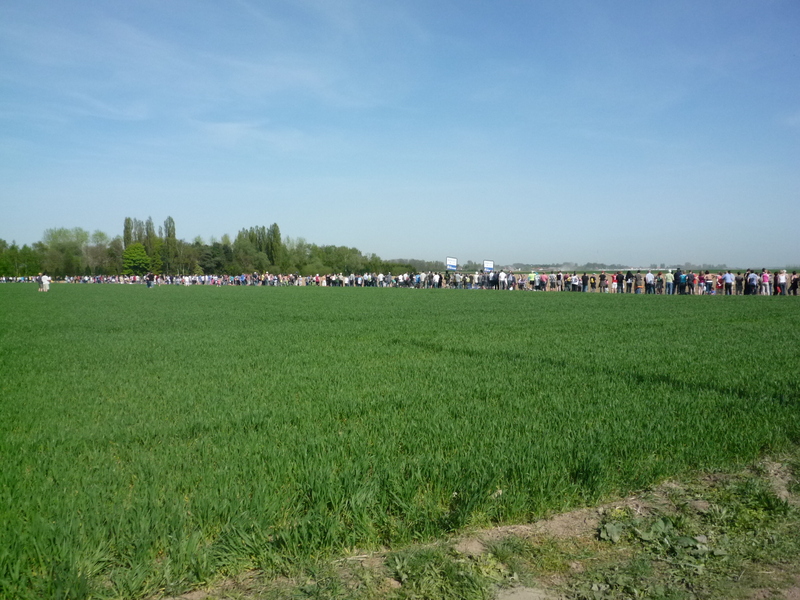 Instead we sped towards our last chance, the Carrefour de l’Arbe, where our ‘race’ finished the day before. On the way I snapped a few patriotic folks on the pavé. 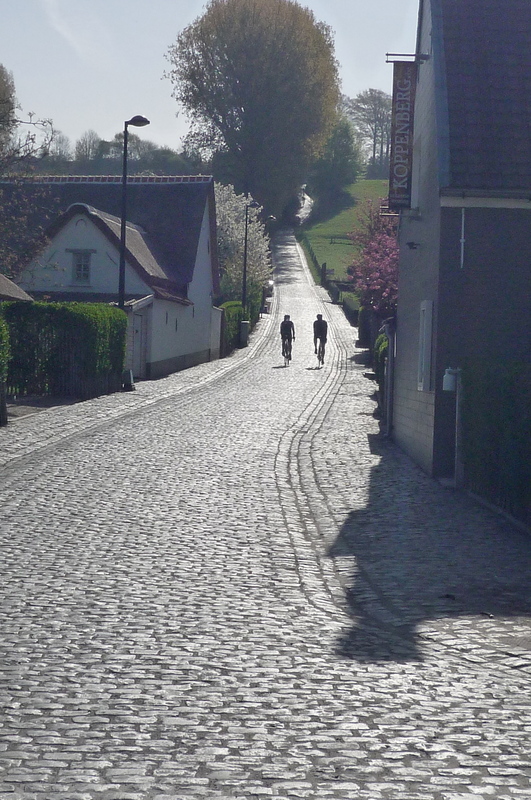 As I said yesterday, the Carrefour de l’Arbe is very often the decisive section of cobbles. If the winner has not attacked by then, he pretty much has to there. 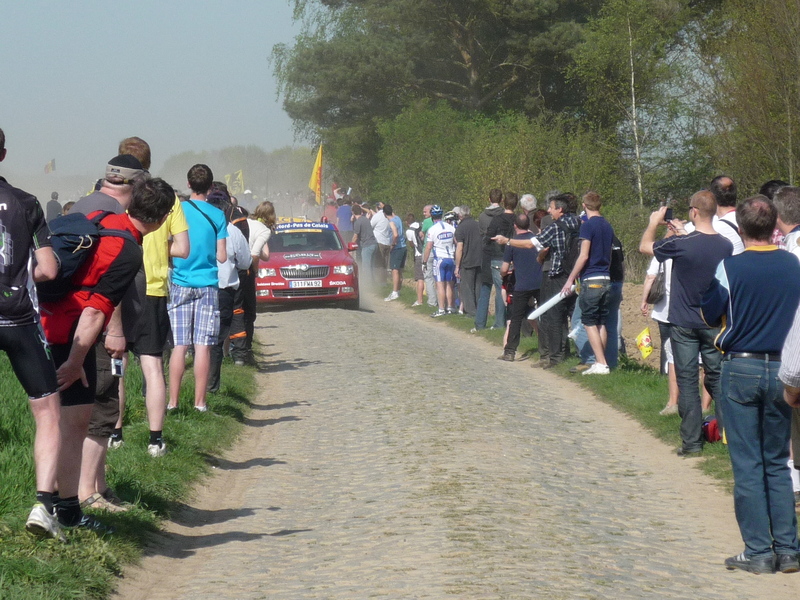 After this section there are only 3 more easy ones and about 15 km to go to the vélodrome of Roubaix. We parked ourselves a few hundres meters from the restaurant, about halfway up this crowd. And Johan Vansummeren. This was just after he put in his attack on the rest of the front group, and, as it turned out, was THE move of the race. Kudos to Alex and William for the viewing-spot choice! More chasers. The one in the green is actually Canadian – a young rider from my home province of Quebec – David Veilleux, who went on to a very respectable 25th place. I had no idea who I was shooting, as I mentioned before, but I was lucky enough to get Cancellara and Hushovd in this next one. No, not the guys in focus. Look left. And finally, our flat-tire guy (I think) from 80 km ago. 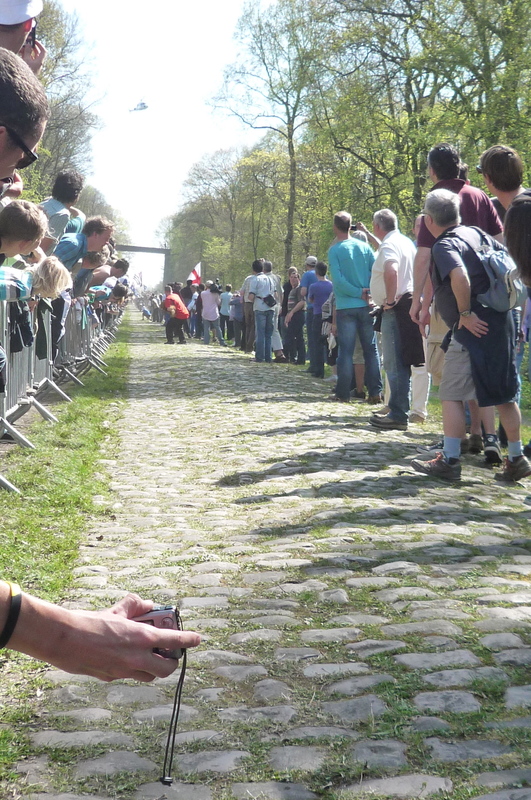 Cancellara went on to finish 2nd, after a very late attack in the suburbs of Roubaix, passing 3 or 4 riders like ‘a hot knife through butter’, as Eurosport reported. Even if he’s got a motor in his bike, he’s still fun to watch. So Hell wasn’t such a bad place after all. It was tough, no question, but not as hot as all the reports…and they really do have great beer! 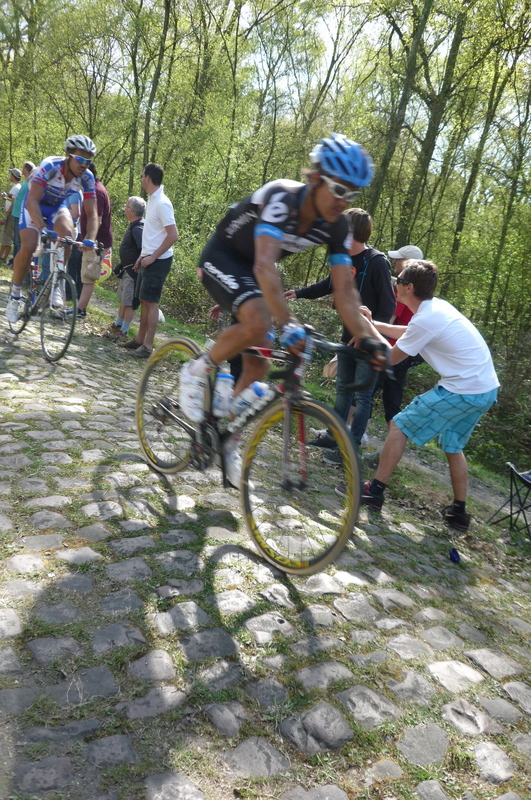 Pavé’s Flickr photos from the pro race. 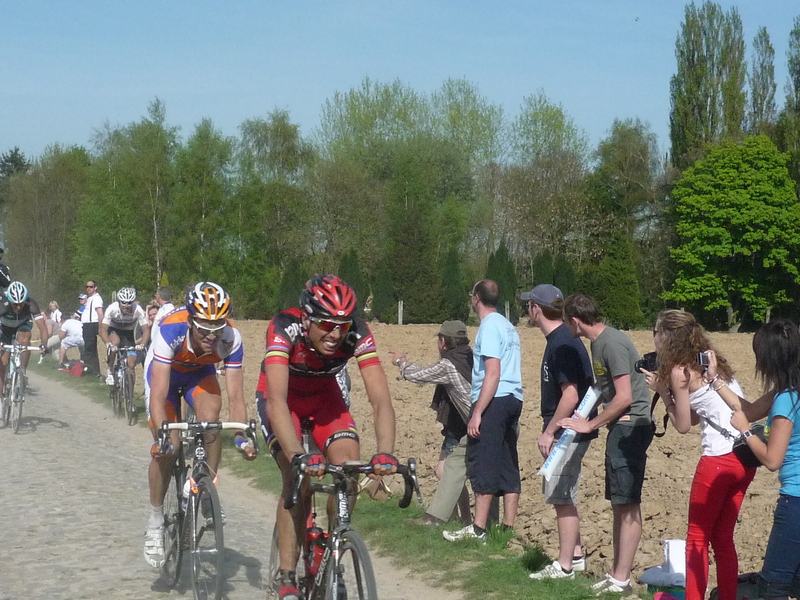 This entry was posted in Belgium, Cycling, Paris-Roubaix and tagged paris roubaix 2011, Pave Cycling Classics. Bookmark the permalink. Wish I’d had your camera up there…although you might not have like the condition it came back in! Cracking stuff. RVV and PR next year for me!! Hope you have the same freakishly nice weather that we had. I watched this on TV and wondered where you might be. You won’t be surprised to know I didn’t see you! The anouncers made a big deal out of the tactics everyone was using to stop Cancellara from winning. They became so obsessed with stopping him that when a relative unknown made his break, nobody could catch him. Cancallara made a helluva try, just to spite the riders who worked so hard to stop him (or so the commentators said). Great pics and great desciptions. I can’t say I’m terribly excited about cobblestones, but perhaps it is an acquired taste. 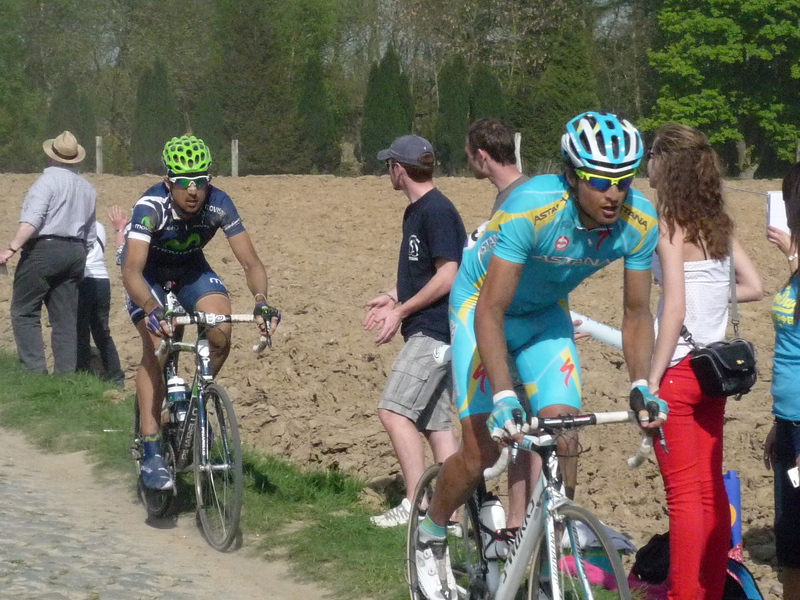 The strategy was similar to the week before, where the other teams neutralized Cancellara in the Tour of Flanders. I don’t claim to know much about these things, but couldn’t Fabian’s team help him out a bit…? At least make sure someone is up in the break to take some pressure off. Maybe these things are easier said than done. Anyway, the man is so far and above everyone else in terms of strength, it’s scary, and that last-moment attack you mentioned above was pretty awesome to watch. About the coverage, even I didn’t see myself, so feel too bad! photo location suggestion for next event….. take the outside of an inside corner…this will clear your view of who’s coming and get a chance to get low enough to the ground and still see who’s coming…get a friend to stand beside on the side that the racers are coming toward you, they can act as blocker (keeps racefans from crowding you )so that you can get a better shot and they can also advise you of who is second or coming close behind the one you are taking a photo of. Love the photos…..
‘Blocker’…sounds like a job for you, big guy! Thanks for the tips. I’ll try them out in the Pyrenees this summer! I enjoyed reading about your weekend. It must have been a great (if painful) experience. Brilliant pics as usual. Thanks, Stephanie. It was both brilliant and painful, but pain always goes away (albeit slower than it used to…) and I’m left with ‘brilliant’! Has spring come to your part of France yet?